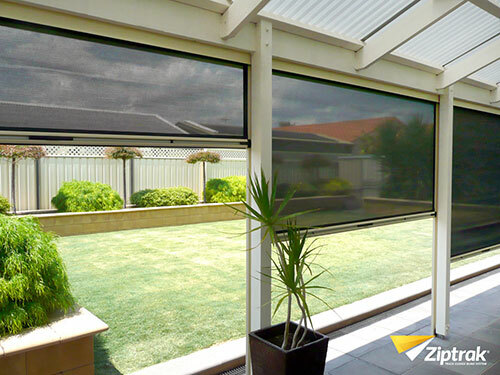 Zip Blinds are the industry’s latest alternatives to Outdoor Roller Blinds. Introduced into the Singapore Market in the past couple of years, Zip Blinds have been widely popular among Singaporeans due to it’s functionality and design. Meant for balconies, patio, outdoor areas etc, Zip Blinds offers state-of-the-art all weather protection and privacy for you and your family members. As per it’s name, Zip Blinds make use of a Zip system that is used between the side of the fabric and the side channels that helps hold the fabric in place. This fixed channel holds the fabrics perfectly in place and only allows the blinds to move vertically when needed. With the fabric being directly built into the side channel, this means that there are no additional gaps and the blinds would then also be able to better block out rain. This effectively extends your balcony and transforms your outdoor area into an indoor one. The Curtain Boutique is a Premium Partner of Ziptrak® and only bring in the most authentic Ziptrak® Blinds directly from Australia. Read more about Ziptrak® HERE.